Prominent & Leading Manufacturer from Ahmedabad, we offer vial filling machine, liquid vial filling stoppering machine, vial dry powder filling machine, injectable dry powder filling machine, sterile dry powder filling machine and dry injection powder filling & stoppering machine. Leveraging on wide prowess, we are influential in manufacturing and supplying precisely designed Vial Filling Machine. 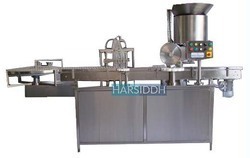 These machines are widely used in pharmaceutical industries for filling medicines in vials of varied sizes and types with uttermost perfection. Owing to their fabrication being processed by utilizing modern machinery and high-grade steel, these machines possess high durability and efficiency. Apart from this, we make the supply of these products in defect-proof packaging at equitable price tags. 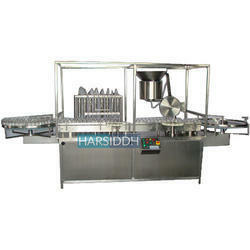 Liquid Vial Filling Stoppering Machine are widely in use in Pharma Industry. Piston pump / Peristaltic pump filling. All Contact Parts Made from S.S 316L & framework by S.S. 304. A.C. Variable Drive for speed adjustment. Digital Vial Counter for counting production output. In-feed & Out-feed Turn Table 24” attached to the machine. No Vial No Filling System. No Vial Machine Stop System. Output(Fills/min) Up to 100 Fills/Min. for single dose. Power(Watt) 415 Volts, 3 Phase with Neutral & Earthing (5 Wire System), 50 Hz. Capacity Up to 100 Fills/Min. for single dose. We are leading manufacturer of all range of Vial Dry Powder Filling machine, our range of Vial Dry Powder Filling machine made of high quality raw material; we have used most latest technology to make our Vial Dry Powder Filling machine. Vial Dry Powder Filling machine is made to meet the client’s customised requirement, Vial Dry Powder Filling machine ensure optimum performance to meet the performance. We have Single Wheel Vial Dry Powder Filling machine, and Double Wheel Vial Dry Powder Filling machine, this machine is also known as Single head Vial Dry Powder Filling machine and Two head Vial Dry Powder Filling machine. Output(Fills/min) Up to 220 Fills/Min. for single dose. Capacity Up to 220 Fills/Min. for single dose. We are leading manufacturer of all range of Injectable Dry Powder Filling machine, our range of Injectable Dry Powder Filling machine made of high quality raw material; we have used most latest technology to make our Injectable Dry Powder Filling machine. Injectable Dry Powder Filling machine is made to meet the client’s customised requirement, Injectable Dry Powder Filling machine ensure optimum performance to meet the performance. We have Single Wheel Injectable Dry Powder Filling machine, and Double Wheel Injectable Dry Powder Filling machine, this machine is also known as Single head Injectable Dry Powder Filling machine and Two head Injectable Dry Powder Filling machine. 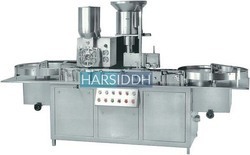 Sterile Dry Powder Filling machine offered by Harsiddh is vertical type screw filling machine This Sterile Dry Powder Filling machine finds suitability for meeting the requirements of packaging Injectable Powder to vial. its 304 and 316 grade stainless steel construction finish also makes these provide for lasting performance. Our range of Sterile Dry Powder Filling machine includes Single Head Sterile Dry Powder Filling machine and Two Head Sterile Dry Powder Filling machine. We are leading manufacturer of all range of Dry Injection Powder Filling & Stoppering Machine, our range of Dry Injection Powder Filling & Stoppering Machine made of high quality raw material; we have used most latest technology to make our Dry Injection Powder Filling & Stoppering Machine. Dry Injection Powder Filling & Stoppering Machine is made to meet the client’s customised requirement, Dry Injection Powder Filling & Stoppering Machine ensure optimum performance to meet the performance. We have Single Wheel Dry Injection Powder Filling & Stoppering Machine, and Double Wheel Dry Injection Powder Filling & Stoppering Machine, this machine is also known as Single head Dry Injection Powder Filling & Stoppering Machine and Two head Dry Injection Powder Filling & Stoppering Machine. We are leading manufacturer of Automatic Vial Liquid Filling Machine. our range of Automatic Vial Liquid Filling Machine has many models like Single Head Automatic Vial Liquid Filling Machine, Two Head Automatic Vial Liquid Filling Machine, Four Head Automatic Vial Liquid Filling Machine and Eight Head Automatic Vial Liquid Filling Machine, it has another model which gives highest production is Rotary Type Automatic Vial Liquid Filling Machine. Harsiddh engineering is reputed for providing small, easy to use, economical and high quality vial filling and stoppering machines. Our six head filling and sealing machine is specially designed to cater for all pharmaceutical, R&D and other chemical filling of sterile vials. The equipment handles vials ranging in various capacities. Our Vial Liquid Filling with Rubber Stoppering Machine has CE certification. In-feed & Out-feed Turn Table 24” attached with machine. Power Specification: 1.5 H.P., 3 Phase, 4 Wire System, 50 Hz. Production Capacity: Up to 40 ¿¿¿ 60 Vials/Min.